From left: Palomar College Governing Board Student Trustee Amber Bancroft; Trustee Nina Deerfield; Board President Paul McNamara; Board Vice President Dr. John Halcón; and Superintendent/President Dr. Joi Lin Blake. 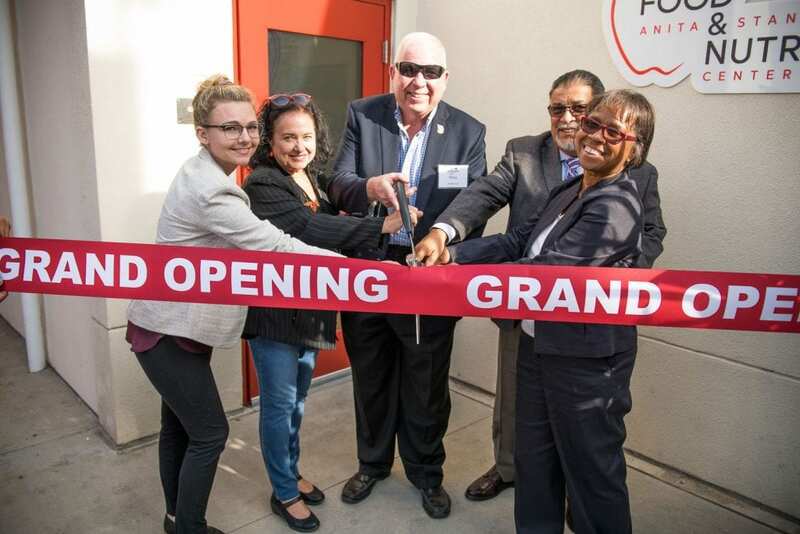 Officials and guests of Palomar College gathered on Monday, Oct. 29 to celebrate the opening of the Anita and Stan Maag Food & Nutrition Center at the college’s main campus. The center represents a leap forward in Palomar’s ability to serve students suffering from food insecurity, college leaders said. The project was funded by a $400,000 donation and has been under construction since March, when crews broke ground to convert a former faculty and staff lounge near the Student Union. The Palomar College Office of Student Affairs has operated a food pantry for 34 years, providing weekly food distributions and longer-term support for students who need it, but the program outgrew its previous home. With the new space, the college now has refrigerators for distributing nutrient-rich produce and dairy, as well as a staging area to accept pallets of food. For more information about the Anita and Stan Maag Food & Nutrition Center, please visit https://www2.palomar.edu/pages/studentaffairs/student-assistance/palomar-college-food-bank/.